↑ Lale Tayla and Figen Bingul (२००७). "नासा "for the benefit of all. "— Dr. Süleyman Gokoglu महोदयेन सह साक्षात्कारः". The Light Millennium. ↑ यु.एस्. सेन्टेन्नियल् अफ़् फ्लैट् कमिशन्, NACA. Centennialofflight.gov. परिशोधितम् २०११-११-०३. ↑ "नासा कार्यशक्तिः (प्रारूपम्)". नासा. जानवरी ११, २०११. Retrieved डिसेम्बर् १७, २०१२. ↑ टैटल्, एमि (डिसेम्बर् २, २०११). "नासायाः बजेट् २०१२". डिस्कवरी न्युज़्. Retrieved जनवरी ३०, २०१२. 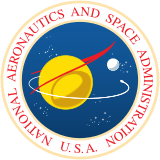 ↑ NASA (2005). "The National Aeronautics and Space Act". NASA. Retrieved 29 August 2007. ↑ Lucas, William R. (1989-07). From naca to nasa. NASA. pp. 32–33. ISBN 978-0-16-004259-1. http://history.nasa.gov/SP-4206/ch2.htm#32. Retrieved 27 May 2009. ↑ "What Does NASA Do?". NASA. 2005. Retrieved 29 August 2007. ↑ Release:11-301, NASA (14 September 2011). "NASA Announces Design For New Deep Space Exploration System". NASA. Retrieved 14 September 2011. ↑ VideoLibrary, C-Span (14 September 2011). "Press Conference on the Future of NASA Space Program". c-span.org. Retrieved 14 September 2011. ↑ NewYorkTimes, The. "NASA Unveils New Rocket Design", nytimes.com, 14 September 2011. Retrieved on 14 September 2011. ↑ "एरोनॉटिक्स् ( NACA ) राष्ट्रियमन्त्रालयः एवं 'सुपर्सनिक् बेल् एक्स्-१' विमानम्". नासा. Retrieved सेप्टेम्बर् ३०, २०११. ↑ Subcommittee on Military Construction, United States. Congress. Senate. Committee on Armed Services (21, 24 January 1958). Supplemental military construction authorization (Air Force). : Hearings, Eighty-fifth Congress, second session, on H.R. 9739.. http://books.google.com/books/about/Fiscal_year_1958_supplemental_military_c.html?id=N-IPAAAAIAAJ. ↑ "T. KEITH GLENNAN". NASA. 4 August 2006. Retrieved 15 July 2009. "Quest: The History of Spaceflight Quarterly"